Don’t you just love all the sparkle at Christmas? Add extra glimmer to your tree or Christmas decorations with these bright sparkly ornaments. 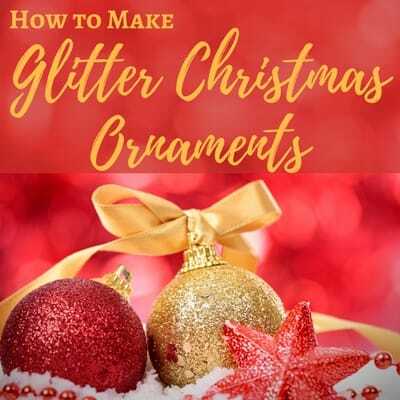 Learn how to make glitter Christmas ornaments at home in just minutes. I love easy projects like this that are guaranteed to turn out well! It’s a fun little craft that even small children can help with…and the ornaments make cute gifts for teachers or grandparents. 1. Cover your work surface with newspapers or an old tablecloth, as glitter can be a bit messy! 2. Carefully unscrew the top from the Christmas ornament. 3. Pour about a half of cup of floor cleaner into the plastic cup…you don’t have to have an exact measure here. 4. Bend the cup slightly, then carefully pour a bit of the cleaner into the ornament. 5. Gently twirl the ornament around until the cleaner has fully coated the inside of the ornament. 6. Once the inside is fully coated, dump the cleaner back into the original plastic cup so that you can re-use it for other ornaments. 7. Place the ornament with the opening facing down on the top of an empty cup so that all the cleaner drains out. 8. Leave the ornament to dry for about 2 minutes. 10. Cover the top of the ornament with a paper towel and shake the ornament to make sure that there aren’t any floor cleaner bubbles or globs left inside the ornament. 11. Pour the glitter into a clean plastic cup. 12. Bend the cup slightly and then pour the glitter into the ornament. 13. Cover the ornament with a paper towel and then shake it until the inside of the ornament is fully coated. 14. Pour the excess glitter back into the same plastic cup. 15. Let the ornament dry then put the cap back on. This is really a straightforward project that is pretty much no-fail. Each ornament just takes a few minutes to make…the drying takes the longest. Be sure to use fine or extra-fine glitter, as regular glitter doesn’t work as well. They look fabulous on your Christmas tree, in a clear glass bowl, or added to a wreath or other favorite holiday decoration.